Tomorrow's MMI is up, but just barely. Tomorrow's mood pattern is complex. There is a slight bullish trend component, a volatility component which could point in either direction, and a government or global component which is more likely than not positive. 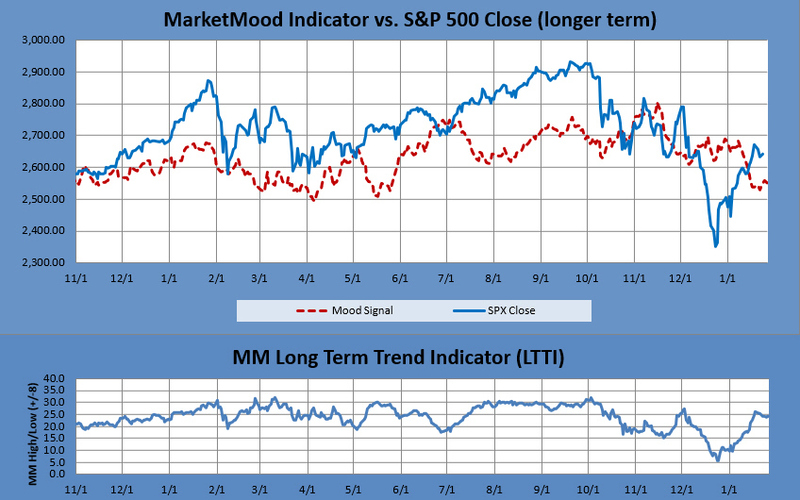 Friday's mood pattern is completely irrational, and if the market closes up, Friday would likely be a local top. Regardless, be on the lookout for an important high or low on Friday due to the MM turn date. MMI for Friday is up, but Friday's mood pattern is "hope in spite of the facts." This delusion/denial filled irrational pattern is usually near term bullish, and then followed by a negative "wake up call." Friday is a MM turn date which means we are looking for a significant high or low at or near Friday. This weekend's MMI (Monday open) is net down, and the mood pattern pointing to a "new chapter" of some type which has a serious tone to it and a government/global crisis component. A flip on Sunday does not change the overall MMI calculation for the weekend, but adds some uncertainty and could add some turbulence as Monday RTH approaches. The MAM has issued a "significant trend change" signal from up to down during the window 1/18-1/25. A significant trend change means a noticeable trend change. The primary outlook is that a corrective move is in progress. Weekly charts are primarily down over the next few weeks. Monthly charts shows the market to be primarily in a corrective move through February then turning up sharply. A low is anticipated February/March.